Recently, I was asked the question as to our use of the phrase “Red Sea” versus the phrase “Reed Sea,” and whether or not this was a notorious error found within other English interpretations. This answer is not as simple as you might expect, but holds with it a certain amount of excitement. Let’s take a look. There are two Hebrew terms used that are both interpreted as the Red Sea. The first is a two word combination which is ים סוֹף (soph yam). The second is a one word construct derived from the three letter root (soph) which is סוּפָה (sophah). Neither one of these can be directly translated as the Red Sea. However, the writers of the works found in the collection affectionately called the Brit Chadashah and known traditionally as the New Testament, concluded that at all times, these references were to the Red Sea. He brought them out, after that he had showed wonders and signs in the land of Egypt, and in the Red (ερυθρος eruthros, i.e., red) sea (θαλασσα thalassa, i.e., sea), and in the wilderness forty years. By faith they passed through the Red (ερυθρος eruthros) sea (θαλασσα thalassa) as by dry land: which the Egyptians assaying to do were drowned. Let us return to the Hebrew and see if the conclusion that the English reference to the same situation, i.e., the crossing, should read Red Sea or Reed Sea (or something different entirely). The Hebrew is so very interesting, especially when the ancient language was without the benefit of vowels per se. Therefore, the pronunciation is directly dependent on how the word was actually heard at that time. There are no witnesses, so our conclusions must follow the logic of that which exists. So, let us take a look at the word סוֹף (soph). Our first example is an important one, for in this case, the word means end. But the judgment shall sit, and they shall take away his dominion, to consume and to destroy it unto the end סוֹף (soph). 27 And the kingdom and dominion, and the greatness of the kingdom under the whole heaven, shall be given to the people of the Qodeshiym of EL ELYON, whose kingdom is an everlasting kingdom, and all dominions shall serve and obey him. 28 Hitherto is the end סוֹף (soph) of the matter. As for me Daniye’l, my cogitations much troubled me, and my countenance changed in me: but I kept the matter in my heart. For those of us who study the mysteries, the Ayn Soph (zero ending) is a phrase used to describe infinity. The Or Ayn Soph is the light without end, which of course becomes the Or Ha’aretz, or the light of the world. Let us see if this is the soph millaw (the end of the matter). Strong’s gives us six different forms of סוֹף, numbers 5486, 5487, 5488, 5489, 5490, and 5491. Brown Driver Briggs tells us that the word soph means in the first instance, to come to an end; to make an end of; end; conclusion. Once you arrive at later usages, we find reeds or rushes, which when used in the combination soph yam, the explicit meaning would be sea of reeds or rushes, which in the Greek included the wider name, the Red Sea, which, again according to BDB, was given to the upper end of the Gulf Sea, extending into the Bitter Lakes, shallow and marshy. While a word-for-word interpretation might require us to say in regard to the soph yam, that it is the End of the Sea, BDB states that the name soph yam applied only to arms of the Red Sea. Part of our policy in the presentation of Eth Cepher was to homogenize the names across the text, such that Elias (meaning Elijah in the traditional) became Eliyahu, and Esias (meaning Isaiah) became Yesha’yahu. While reeds may be consistent with the usage, we believe that the better and more consistent usage is Red Sea, given its reference in the Brit Chadashah. The second term interpreted as Red Sea is a derivative term, סוּפָה (sophah). Sophah is a feminine suffix to the term soph, which suddenly comes to mean hurricane in the literal translation, and is most often interpreted as a tempest [Iyov (Job) 27:20], a storm [Iyov (Job) 21:18; Tehilliym (Psalm) 83:15; Yesha’yahu (Isaiah) 29:6], or whirlwind [Iyov (Job) 37:9; Mishlei (Proverbs) 1:27; 10:25; Yesha’yahu (Isaiah) 5:28; 17:13; 21:1; 66:15; Yermiyahu (Jeremiah) 4:13; Husha (Hosea) 8:7; Amoc (Amos) 1:14; Nachum (Nahum) 1:3. In only one place is sophah interpreted as Red Sea: Bemidbar (Numbers) 21:14, an interesting passage to be sure. 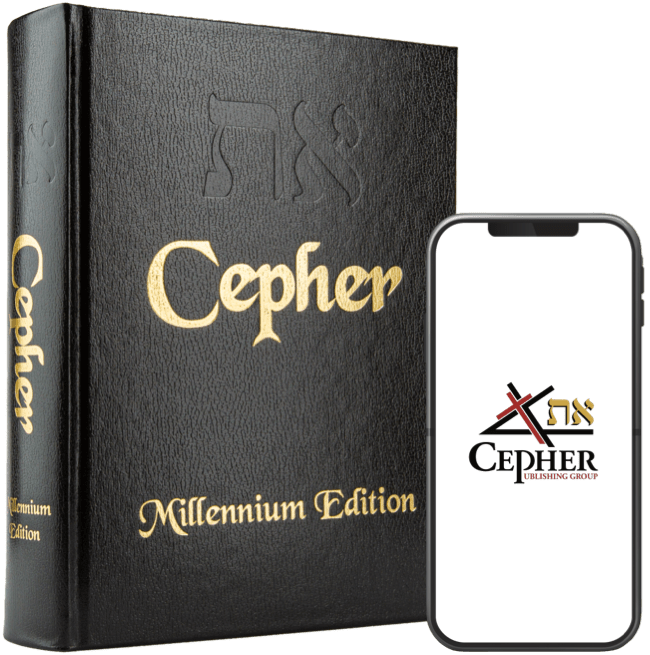 This is an interesting reference, because it declares the existence of a book about which we know nothing, the cepher milchamah, which has been interpreted as the book of the wars of YAHUAH. However, a closer look at the word milchamah may be in order. The root of this word is actually lacham לָחַם, which means to eat or devour. So, we have the prefix ma’ which means what, and the suffix ah, which makes it a feminine noun. Literally, given the root, the word may better be understood as, in a literal sense, what she devoured, or what she ate, and without abbreviation, the word would be pronounce ma’lacham’ah. This could describe the cepher which detailed the account of the house of Yisra’el during the times of their survival on manna, which is described in the book Bemidbar (Numbers). Bemidbar means in the wilderness. Back to our word sophah: Here in this passage is the only time the word is translated as Red Sea, yet it is a descriptive of what took place in dividing the sea – i.e., a tempest or whirlwind. It is an appropriate descriptive, given that its context is with the brooks of Arnon, which is that area to the opposite of the Red Sea (now the Gulf of Aden) where the crossing was actually made (well to the north of the traditional site). One can understand how this would jar the beliefs of those who hold that the house of Yisra’el never made a miraculous crossing over such a dramatic waterway as the Red Sea (now the Gulf of Aden), but instead wound through the marshes of the Reed Sea; however new archeological revelation, including the discovery of the Egyptian Army artifacts at the bottom of the shallow portion of the Red Sea, and the discovery of the actual Mount Ciynay and Mount Horeb in Saudi Arabia, gives credence to all of these claims. For they have sown the wind ר֫וּחַ (ruach), and they shall reap the whirlwind סוּפָה (sophah): it has no stalk: the bud shall yield no meal: if so be it yield, the strangers shall swallow it up.